It's done! I've officially Konmari'd the crap out of our house. This is a very, very good day and a long time coming -- I'm so happy to be done! I talked about how it started to change my mindset here -- this book has totally changed my life. I thought I was good at letting go of things, but after reading this I realized I really wasn't good at all. I still had this inexplicable thing holding me back from truly getting rid of all the crap. My mindset before was...I bought it to redo it, I bought it on sale, I spent a lot of money on it, someone gave it to me, someday when I finish ____ this item will be good there, it needs to be fixed and then we can use it, someday this might be back in style, I made this myself, if I can find the cord that charges it I'll be able to use it, it may fit again someday, I haven't read it yet (but had it for years)…on and on and on. 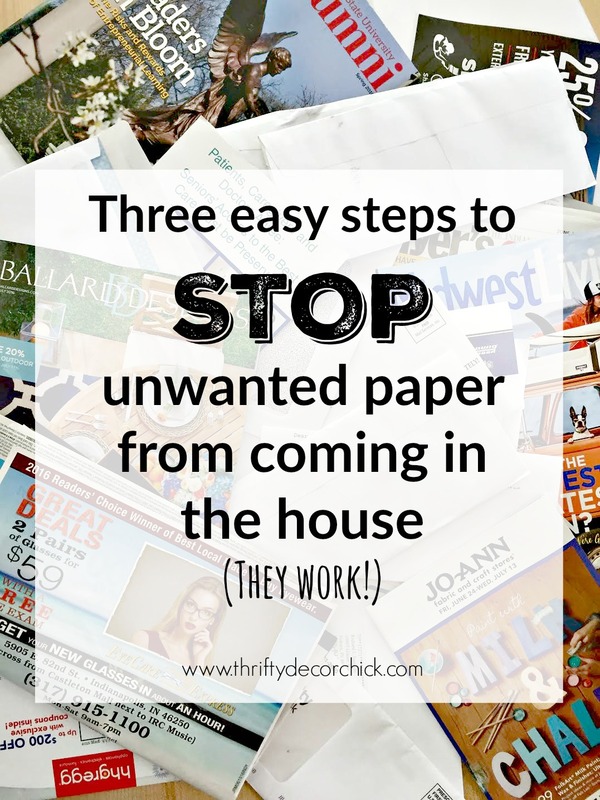 When you approach decluttering this way you'll hit the surface and that's it. It will still make you feel good, don't get me wrong. But the stuff will come back. This book freed me. I don't say that lightly. Now the only things I ask myself are but do we LOVE it and do we USE it. That's it. Nothing else. And I don't ask myself what I need to get rid of, but instead, what do I want to keep? That is HUGE for me and one of the parts that really stuck out to me. I've let go of the guilt of getting rid of something I spent money on -- because how I am honoring that money by having it sit on a shelf forever? Passing it on to someone who will love it actually makes me so happy now. I've let go of that guilt completely. I still understand the value of things of course -- probably more than before. I buy a lot less than I used to. I don't buy something unless I am head over heels in love with it and know exactly what I will do with it or where it will go. I used to buy things and they would sometimes sit for a very long time in my trunk or in a pile or on a shelf and I've realized if I really, really loved those things I would have made a place for them immediately. Some items were donated, some went to consignment (I've already made $50 in less than a week), some went to my sister, some went to a local shelter, some went to their homes (Nerf guns), some were returned (hundreds of dollars back). Some I sold on Facebook to friends, some I threw away (not much). Bottom line -- it is all OUT OF MY HOUSE. 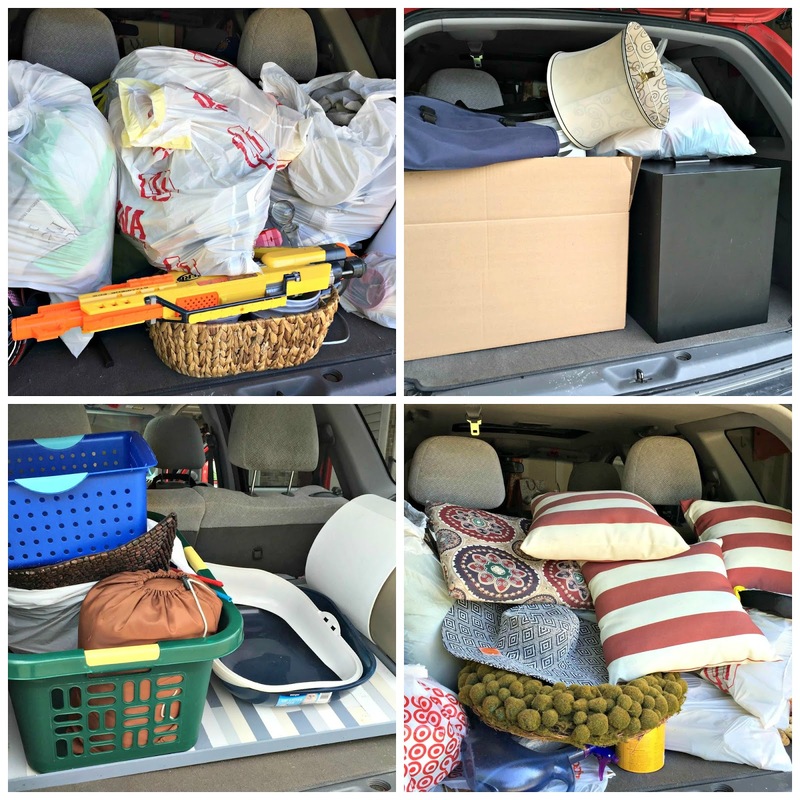 Every trip with a carload full lightened our home tremendously. I couldn't get things out of our house fast enough. My recommendation if you want to read this book is to start when you know you'll have time. It will make you want to tear through your home. And if you're like me you'll laugh when she says it will take six months -- "Haha! I'm no rookie! Two weeks max!" And nine months later you'll be like, dang man, that took forever. Funny thing is I'm still not done with the book! The end focuses more on how to organize what you have left and I'll show you how I'm organizing things later. My focus has been on purging. I feel like I'm pretty good at the organizing thing already but I'm interested to hear what she has to say. This is the part I find quite relaxing and cathartic. I sorted through them, got rid of half and only kept those that worked perfectly. We had a stupid amount of pens and pencils. If a pencil was missing an eraser it was gone. Before I would have kept it because I'd think -- I can go buy an eraser to put on the end and then use it! But that little thing was never high on the priority list so the unusable pencil would continue to sit there. And then I'd finally buy a package of erasers and then I'm bringing more stuff into my house when I already have 50 perfectly good pencils to use! That's how my mind used to work. You know what's funny? I only burn maybe two candles in our house. I don't burn them often because I worry about our cats knocking into them. So why did I have so many?? I kept the ones I LOVED, which was maybe a third of them. I don't need to buy another candle for about ten years. I wonder how much we spent on extension cords over the years? Gah. This is the stuff that makes me kick myself. 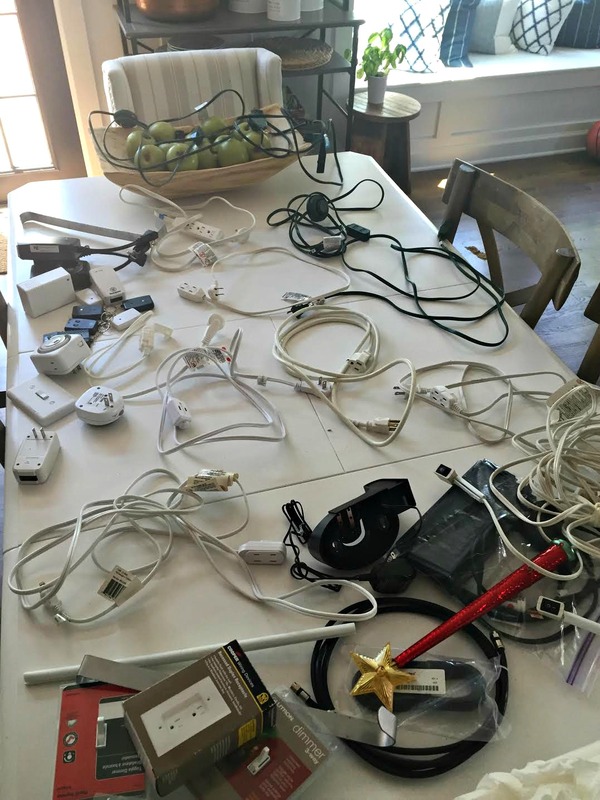 I kept the cords for the Christmas trees, two surge protectors, one long extension cord and one short one. That's it. YES, there are some kooky ideas in this book -- pick and choose what you want to use. I still won't fold our socks and line them up perfectly in our drawers...but I've heard from many who love it after reading her method. Take what you want to use and ignore the rest. You'll still get something out of this book. I really recommend you read this post where I talk more in depth about my approach as I started incorporating the method. Here's the thing. I don't ever plan on doing this again. Ever ever ever. I don't want to ever take weeks or months to purge the house again. As much as I love the feeling, I'm done. Obviously I'll have to keep up with things but it will be constant and not nearly the amount of work this was. So far so good -- I've been so deliberate with what I've brought into the house over the last nine months I don't think this will be difficult. I'll let you know how it goes! One thing I know for sure…our house has never been easier to keep clean. In 12 years it's never been like this. It's been a slow change over this process but every week I noticed it more and more. Our kitchen island used to be covered with stuff every single day. Or the kitchen table. Or the nightstands. And I would clear them off and do it all over again. It still happens occasionally but it's rare -- like this week for example. It was the last week of school so the number of items coming home in the backpack were insane. The kitchen table was covered for a couple days but because of how I approach STUFF now it doesn't stress me out as much and it was much easier to clean up. I think that is the very best part. I've NEVER enjoyed our house more than I have lately. Having only things we love and use makes life simpler and sweeter. Have you read this book and what did you think of the process? If you are interested in Konmari method book it's a very quick read. You can find it here. You can see all of my organization projects and tips here! EDITED TO ADD: Check out my three year Konmari update and my tips for getting spouses and kids on board! I'm so glad you liked the book and it had such a great impact on your life, because I did not like it at all. I thought it was silly. I'm soooo going to get this book! My family calls me a hoarder at times & I try very hard to get rid of stuff! My pens, candles, etc...look just like your pictures! I love seeing this! I just got it and can't wait to tackle it! I have the book and love it. I've done the purging of my things down to the things I love and use. The problem is that my husband and three kids have SO MUCH STUFF and don't want to purge. So...my house is always cluttered and filled with all of their stuff. The Konmari system says I can't clean out other people's things. It's frustrating. I am so glad you've made it work. How did you deal with your husband and son's things? Ooh yes! I want to know too! I LOVED the book and am in the beginning stages of discarding. Glad to know the end result really is worth it! But I am afraid it won't make a big difference if the rest of the family doesn't join in. I've also stumbled with this. Read the book and want to do it right, but husband won't get on board. I did everything I have sole control on, but I was already a very tidy person and it has hardly made a dent in this house. Frustrating. My children are off to college and when they graduate move out for good- so does their stuff! My only solution. Husband's stuff I guess we're stuck with. I feel your pain, because my husband actuually feels more comfortable with piles of stuff packed in around him than he does a clean, uncluttered space. I have researched hoarder tendancies to better understand him, and the consistent theme is this makes them feel secure. I cannot change him,he has to want to change. But we were able to work out a deal where he is allowed 2 rooms - an "office" and a storage room - both out of the main living area,that he can fill to the brim, and ONE surface in our main living area (out of plain sight) where he can pile things (I cover this with a pretty table cloth when company comes or temporarily move it). If his clutter begins to drift out of these areas, I move it back, quietly but firmly. While not the ideal solution, this has given me back my dignity while still treating him with the respect he deserves as an adult. His spaces make me cringe, but I just stay out of them and focus on the 60% of the house I can control. Hope you can work out something like that too! My husband was raised in a 26 room hotel, that also had two full dining rooms, a chef, etc. He stores canned goods on shelves in the basement like we're ready to entertain a banquet at a moment's notice. He has saved all the receipts from this parents' business and has them in the original rubber bands (from his father) from the 1960s, 70s, 80s, and 90s when they sold the hotel. His parents have been dead almost 15 years, but nothing has ever been thrown out. We got their furniture, their dishes, pots and pans, everything, and we live in a 3 bedroom single level ranch home. I can't begin to say how this feels for me. I have my own room where I spend most of my time, and it is orderly, clean, and minimalist. This is not "organized chaos" even though he actually does know where everything is in our house. Oh my. I've been downsizing for a couple of years now. It feels so good to get things out of the house. 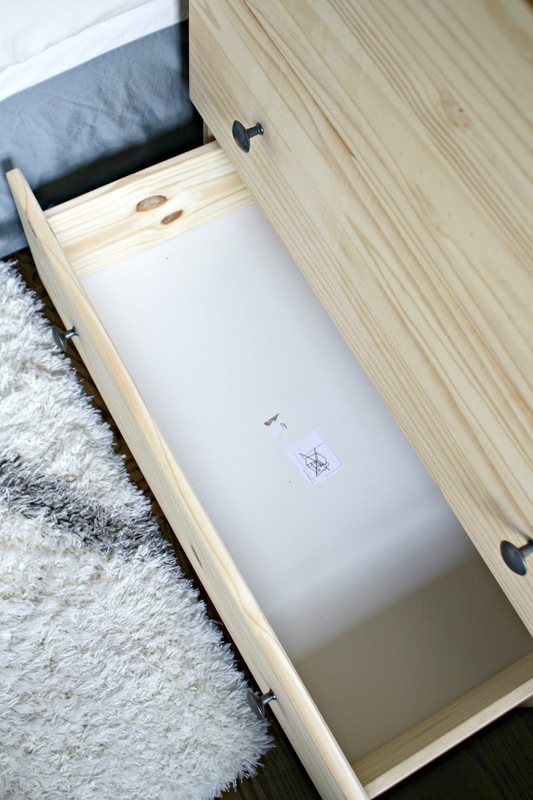 If something is just sitting on a shelf or in a drawer, it needs to go so that it can be used! I too read the book. And while I didn't follow all of her principles to a T, I did find myself letting go of more and more stuff. It feels good to have empty drawers, clean surfaces, room to breathe. I am very organized by nature, but even so I found myself finding things we truly did not need or use. And agree, once you have gone through the process it is so much easier to keep up with things. I love the book! A year ago I sorted through my clothes and everything that I was not wearing, was uncomfortable, or didn't fit, I donated. I had only a few items left in my closet to organize. The one thing that stood out to me was that I have very few items left to wear so I started going shopping. Now I know what I have and what looks good on me and I never buy anything unless I love it and it can be worn with other items of clothing. My closet and chest of drawers have STAYED organized this year! That has been the best part! Now I need to tackle the rest of the house. Wow! I can see how useful that gathering up similar items would be just seeing you do it. Making me think about how many objects I probably have duplicates of - now I've got to give this a try. Oh gosh...I admire you. I have a hard time reading that book. (I have read the entire thing, but cannot bring myself to entirely practice what she preaches. Love seeing the results! It's a pretty striking change, right? I love the book. Bought it after one of your posts and have read through the purging sections so far. I went out of order and started with books (we don't have that many and I find it personally easier to let go of than clothes). I made my husband do it with me one evening because most of them were his. Not having read the book, he thought it was ridiculous taking the of the shelf to just put them back, but he's nice and played along. After it was done, he did say how nice it was just having one bookshelf that now fits all our books (vs throughout there house, pulled on top of each other). I then started my clothes, which was much more difficult. I ended up donating 7 garbage bags fill of just my clothes! (That's after my winter purge, before I read the book!) It feels great having extra empty drawers and never want to go shopping again! So far we have done our clothes, bed linen and towels and found new ways to fold and store them. Initially it took a little while to get the hang of the folding but it is the one thing I have kept up. 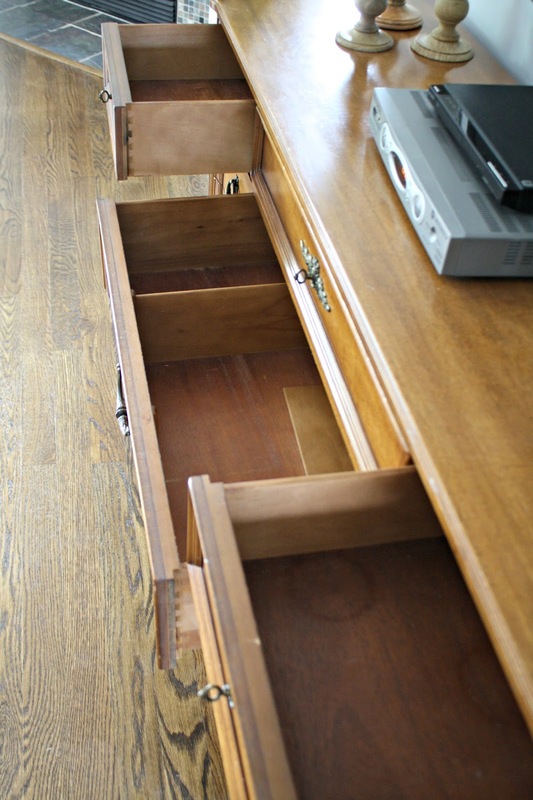 Our drawers have never been neater. I was always having to pull my hubbies t-shirts out and fix them as everything was layeredon top of each other. Now they are folded to stand up and it's so easy, I've not had to do it at all since we changed. Me: Why do you have so many pens? Me: Yes, if half of them don't work! Him: How do you know they don't work? Me: Let's see shall we?.... oh look, this one doesn't work, that one doesn't work... what do you know THIS one doesn't work EITHER! Me: BUT THEY DON'T WORK!! Him: But they're still mine. Me: And this is my flat you're cluttering up!! Him: Oh so it's YOUR flat? Me: Oh for God's sake... THEY DON'T EVEN WORK!! Thanks for the conversation between you and your husband, so hilarious. If your MIL lives near enough to actually see what is in your house and so can be offended, why not suggest that going forward she has a box of toys at her house for your kids to play with when they visit her? I haven't read the whole book, but I did start purging. So far I've gotten through clothes, toys, and a few other random things. I agree 100%-I feel lighter with less. The amount of time it takes to pick up now? Drastically reduced. My bedroom hasn't gotten piles of junk in there as bad as before either. Great system and so common sense. I'd been seeing recommendations for this book for months, but finally after reading your post one day I bought the Kindle version. It really, really, really is life-changing. In the last two weeks I have hauled out probably 20 bags to donate, plus countless items of trash to throw away. And I'm still going. I have purged things I never thought I'd get rid of. Things like extra, but mismatched sheets. I haven't used them in YEARS. We don't need them. I made some of the pillowcases. I was totally and completely okay with getting rid of them. I got rid of a TON of children's books, which I never thought I'd do, since I'm trying to collect books for my classroom. But some of the books I had were awful and not well-written, so why keep them? I feel SO much lighter and even though there is clutter everywhere (the results of a billion different little purges) my house feels better. It feels airy and brighter. I've been doing this for 3 months upstairs and have 3 walk-in closets packed to the doors. I've donated, given away, sold. It feels so clean & new. now for the downstairs-I have begun but this is where we REALLY live and it is daunting. I look at one room at a time so I don't get overwhelmed. I don't believe my grown kids will want any of the "extra" accessories, but I will offer. some are probably out of style & should be donated, but I will keep filling those closets with the "good" stuff & offer! It's super interesting to read a story from someone who's actually DONE decluttering! I'm really interested in a more minimalist approach of life, but most of the stories I read from others are when they're going through the process, and not afterwards. 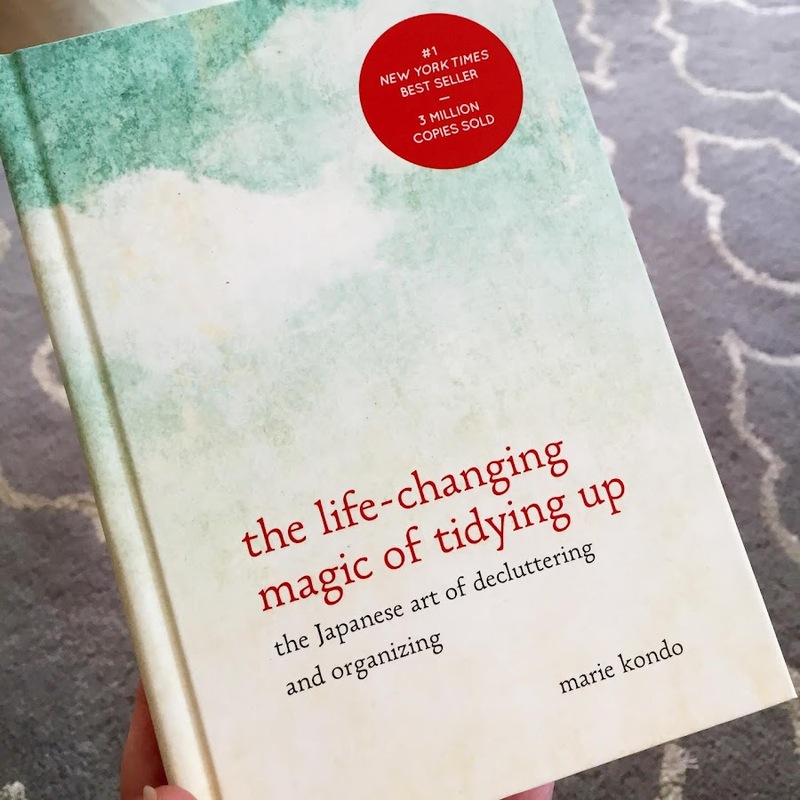 Congrats on you konmari-ing your entire home, that's impressive! I am currently decluttering my clothes, make-up and books. It's a daunting task.. I bought the book because we too are sick of the attic holding stuff that we haven't looked at for 13 years since we moved here. My husband and I married in our 50's and both brought a lot of our stuff to our home. He has a harder time giving stuff up. Now in our 60's we are in that mindset to get rid of things and am ready. It was good to read your take on it! Thanks for sharing. I have the same problem!! It's mostly their clutter. Kids stuff I can deal with, but my husband's stuff I can't. You should see the garage. UGH!! 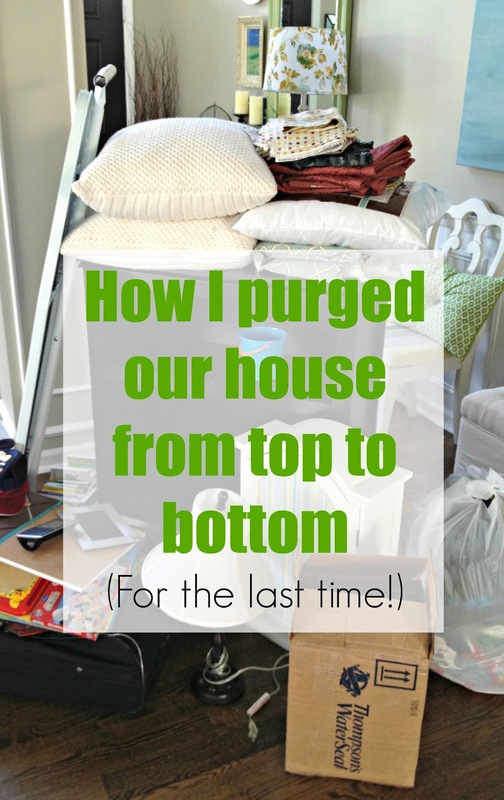 I started doing it and maybe a month in my hubby decided to clean his closet. Baby steps I figure. I wanted to add in case anyone finds them helpful. I too struggled with other family members! I very much respect my husbands space, as he honors so much of what I do in our home. But I did lay out things I requested him to "veto". Many times he came home and I had mismatched socks, holey shirts, ugly old things he's never worn. He felt much less threatened when I laid them out and asked for his blessing to discard or insist on keeping. In the end he only wanted transparency and me not sneaking things in bags. And the obvious stuff (lonely socks) went easily. Some things stayed but not NEARLY what I had feared! It was a nice way to compromise and still respect each others wishes. Yea for you! You honored and respected him and he could obviously see your point. My guy saw how much I was getting rid of stuff and how happy it made me so he said can you help me do this with my stuff? Clothes his adult son purchased for him that he will never wear was sent off for someone else to enjoy. He felt bad but said he understood not keeping stuff because someone else thought you should have it. Yea US! Yea our guys! First of all want to highly commend you for your ultimate purge, takes lots of grit and determination. Now would you please come here to assist me, help me make those decisions? Our youngest daughter has been nagging me, rightfully so, to get rid of all the crap in our house. shed. It's so bad our little house is bursting at seems. I am ashamed to admit our two extra bedrooms can hardly be walked into due to all the crap have brought home from thrift stores. Do I need all that stuff, do I love it? For me can't think about something or will convince myself to keep it, even if not crazy about it. Let me preface this with fact, raised by parents who lived thru Depression and who were hard put to start with so was raised to keep things to tide me over, so wouldn't have to buy it again, and most of all, make things last. I'm still wearing clothes daughter gave me when we first moved here in late summer/2004. She got them from somebody else. Remember the "Marlboro man"? Daughter used to house clean for them, wife would give daughter clothes she didn't want, nice brand name stuff, not things I'd ever buy. Those clothes are mostly all my around house clothes now but still wearing them, GROAN. Yes I really need to purge so very, very much and thank you for sharing, will help get me motivated. And now if you'll excuse me, need to clean out sewing room so can actually do some sewing. Happy holiday weekend. 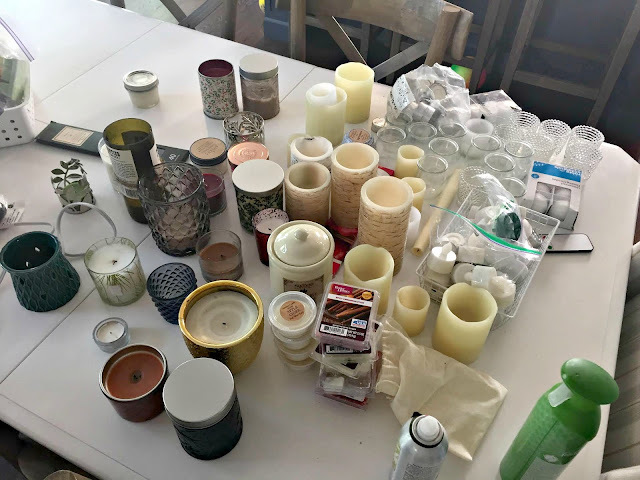 I lost a dear friend who lived with another dear friend a few years back and she collected so many things and many of them were in storage and never used. When we started to go through her things my friend had the hardest time letting go even the simplest things like markers, rubber bands, etc. It really made me realize that I need to purge because what is important to us is only just "stuff" to our family when they have to clean it out. It just makes no sense to keep things packed out of site where we never enjoy them. I love hearing about your results and plan on getting the book and starting after our summer vacation (to see my dear friend who could not let go of all the other friend's things actually). Thank you so much for your post on this subject! My mother's final instructions were for my siblings and I to take whatever we wanted and "throw out the rest." We had the financial luxury of simply locking the door to her house and letting it sit for a year before we were ready. When the time finally came, it was gut wrenching to take my parents' possessions to the donation site, but we donated about 95% of their entire household. HOWEVER, she also told me not to just "give away" her yarn. She knew I like to knit, and I think she expected that I would be in hog heaven. I'm sure she never expected the burden that yarn would become -- it's an entire room's worth of yarn. I "visit" the yarn room with the intention of finally doing something with it...and then I shut the door again about 10 minutes later with tears in my eyes...and I've been doing that for 8 years. I worry I'm setting my son up to think the "yarn shrine" needs to be maintained after I'm gone. I need to choose my favorite yarn from the room in honor of my mother, then figure out a plan for the rest of it. She wanted the yarn to spark joy, not be a burden. I'm sorry for the sadness you feel after visiting the yarn room. I had a thought, and wondered if this might bring you peace. You could do as you said, and choose your favorite yarn in honor of you mother, and make a shawl or throw out of it. With the rest of the yarn, had you ever considered donating it to an organization that knits afghans for the homeless or for our soldiers? Can you image the joy of passing along this amazing gift of love and comfort to others? Whatever you decide, I pray that you find comfort in your mother's memories and her gift. Another great thing to do with yarn is donate it to senior centers. It will bring a great deal of joy there!! Great idea! My mom used to part of a group at her church that knit prayer shawls for persons in the hospital or recovering which her church would distribute. I'm sure your mom would want you to do exactly as you describe, picking out your favorites because you are the yarn expert in the family!! Blessings to you. I am so in agreement! Love the lighter feeling. Got my guy to clean and purge his clothes, and he even folds his clothes her way now. Still have lots to do but I'm loving the feeling. I used to be a garage sale junkie but have no interest, or at least a lot less desire, to go bring any more into the house. Loved this post? I am still looking for this book at the library Sarah as I am a cheap! I am a pretty organized person but I do need some help with getting rid of more sentimental things. We are starting to build a little get away cabin in North Georgia so I am holding on to a lot to take over there but once I get that settled I need to take a page from your book!! I got a perfectly good used copy from thriftbooks.com for around $5.00. You need a copy of your own. It's probably going to take longer than the two or three weeks you can hang on to a library book to get where you want to be. I didn't read the book. Ever blog and video on YouTube has given me all the info I need on the matter. As it is I actually got better encouragement from those things because it came with practical applications that I can see working. This is how I am doing it myself. Thanks for the post! The first time I got the book from the library, I couldn't finish it. Perhaps I was influenced by negative comments on the web. After one of your posts, I got through the book. The key point is to accept the ideas which you feel are helpful to you and discard the rest. 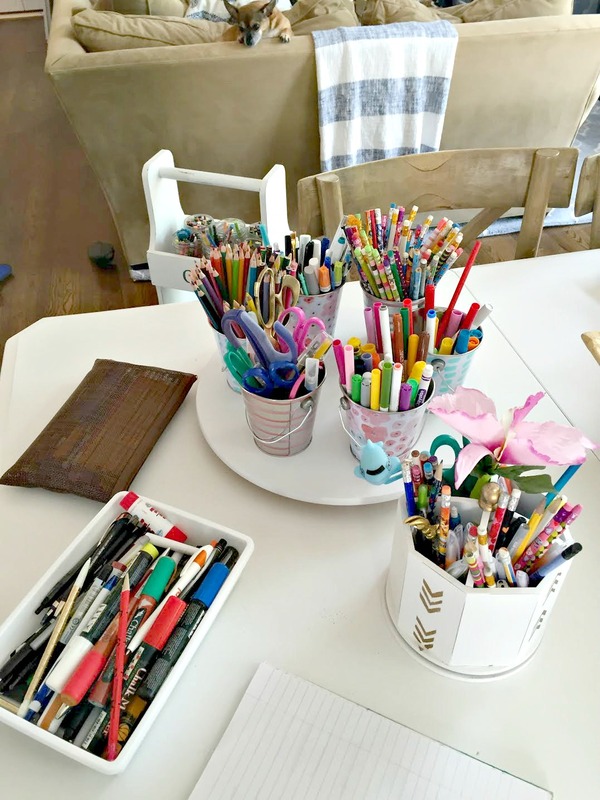 You really took out the time to kick of the junk and unnecessary stuff and your post has fueled me do same with my unwanted stuff at home, and inspired me to be little organized. Ok I think it's time for me to pick up a copy of this book! Proud of you, great job! I look so forward to reading this book but my main problem isn't MY stuff, but my FAMILY'S stuff. How do I trick them into letting me get rid of all their belongings? LOL. I listened to the audiobook and LOVED it!! I started the process and have gotten rid of a ton of stuff. I haven't finished yet but I am making progress. It makes me rethink anything new that I bring into the house. You've done such a great job! I gave up on the method, but I keep toying with the idea of picking up where I left off–and see all your empty shelves/drawers is really inspiring! This book has completely changed my life and my relationship with "stuff". I actually feel sad when someone says they can't finish the book, it's silly, can't do xyz, etc. What do you have to lose by trying it? My husband said he never realized exactly how good I was at organizing until I started to gather like items together. Every single I gathered another category, we were shocked (and honestly, embarrassed) by how much we had. Eye opening. For those worried about husbands and kids, Kondo urges that you go through the process with only your things. It took about two weeks until my husband asked if I could help him with his clothes and my son asked me to help teach him to fold his shirts so he could see all of them at once like mine. This is an inspiring post. I have been feeling the same about clearing out the 'stuff'. Can you share how you consigned some stuff? was it clothes or furniture or stuff ? I am never sure if they will sell at these consignment stores and how it all works - is it seasonal or some stuff will sell always etc?? I love that hook for your hairdryer! What a great idea! My husband and I bought our house almost 3 years ago and I've been trying to be very conscious about what I bring into it. It's large but lacks storage space (you have the basement storage of my dreams) which is annoying but definitely helps me really think about what we are buying. Still, it's amazing how much crap you can accumulate in 3 years. I have that mind set anyway but want to push it further. It is my husband and somewhat my kids. I am a preschool special Ed teacher and currently my youngest is at an age that I can take her toys to my work. She likes that idea. Sometimes she asks for them back and I can bring it back. Those items I know she loves. I had no clue her love of Legos did not replace her love of mega blocks! My husband has books and books and books and is encouraging my oldest to do the same. The girls and I use the library a ton but he refuses and will buy my oldest books at yard sales or used book stores. We have 3 large boxes of his CDs that are loaded onto his iPod. He wants to keep them just in case. Not to mention the 3 boxes of books he has bought but never read. Ugh. Thanks for sharing this... I want the hairdryer hook too. I've done a clothing and book purge... you've inspired me. And I like the thought, it's not what can I purge, what do I love... to keep. You've got me inspired!! I need to go get this book and do this asap. 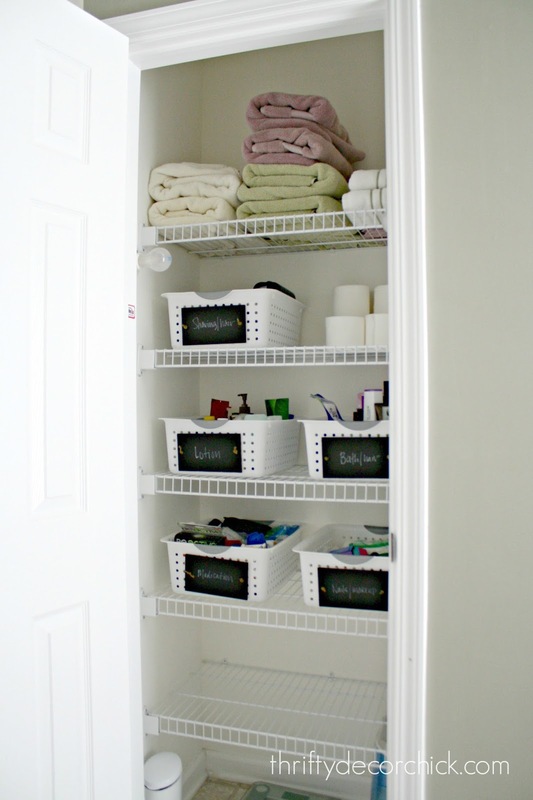 I love organizing and purging I find it therapeutic and relaxing, thanks for sharing :). My heart is with you in the yarn room. I know your feeling, on smaller scale. I lost a very dear aunt over six years ago who I had helped care for in her later years. I have her set of china that I don't use (and don't really have room for in our small home) but can't bear to part with. I know it would be better enjoyed and treasured by someone else. She would just be happy to know it was being used and appreciated, and I know now I'd have her blessing to pass them along. If I can find someone specific who really wants them, I'll feel much better about letting them go. I had a set of China given to me as well. I didn't use it and had no space for it. So I decided to keep one piece as a memory...and have away the rest. It made it easier to part with and it's much easier to store one piece than a while set. I even use it from time to time (it's a platter). Didn't read the book but after getting divorced last year and combining two houses into one I too have done a lot of purging. At times it felt overwhelming but when a project was finished I felt great. It has taken me 14 months so far but I am still going strong. I gave myself 2 years to do both inside and outside of the house. I'm so glad to find someone who has done this already. 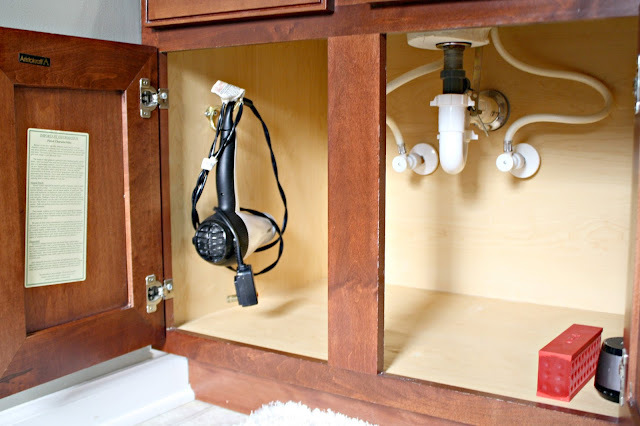 Are you a DIY'er? I want to know how we differentiate our hobby stuff from everything else. For example; Markers/Pens; I'm a scrapbooker, Planner fanatic, journaling, etc. 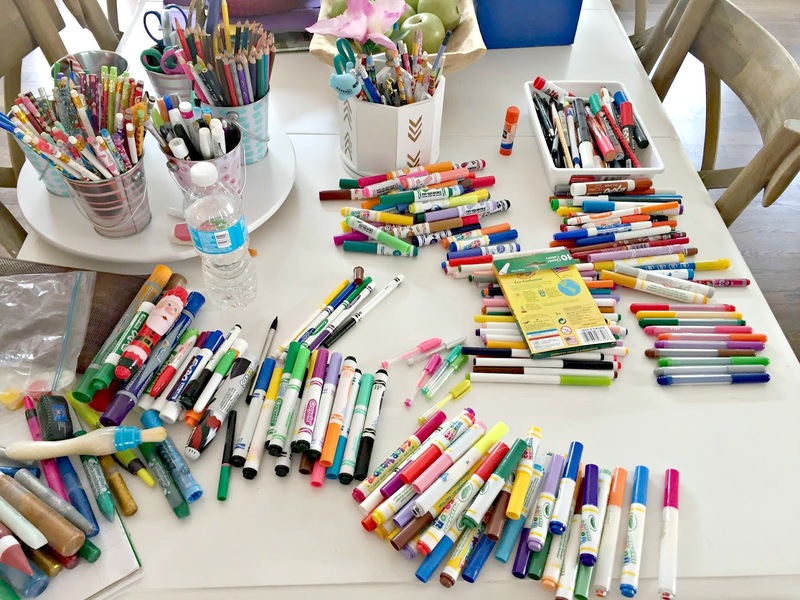 Pens and markers are an obsession of mine, so I have special ones for crafting and all of that stuff, do I go through all of those at the same time as the rest? 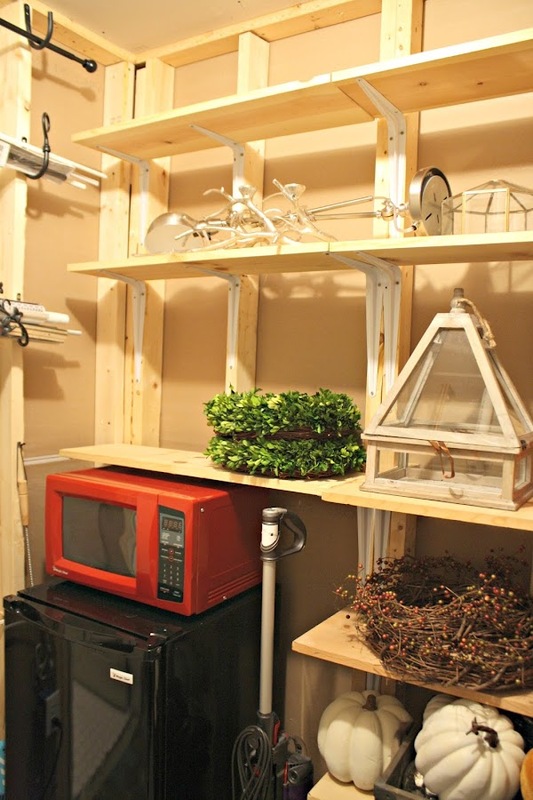 I know the principal is to have all like items in one spot, but I keep all of my DIY stuff in my craft room, so should I keep that room separate from the rest of the process? hope that made sense. I haven't read the book, but it sounds like she advises and implements many of the same ideas and philosophies we have put into practice. I think I would love the book! Thank you for sharing your amazing journey. This post was so inspiring! I so enjoyed reading your journey to organization of your home. I have just read the book and starting to purge 40 years of "stuff". LOL it is hard but each bag that leaves the house seems to make the next easier. Thanks for your encouragement and sharing with all of us that are attempting what seems to be an impossible task. I'm in SE Michigan, anyone want to help me? With grateful thanks for this. I live with a hoarder and though a huge amount of decluttering went on when we moved house, there was still an awful lot left. Unwittingly I did some of the things your comments page recommended - like laying things out and getting him to approve whether we keep them or not. Ultimately, I now know what he is getting for christmas - a book!! And as for my own stuff, it is now much more organised- stuff that needs to be done in 3/6/9/12 months - if it is not done, it gets thrown out. Please keep your posts coming - inspirational is the word!! I especially loved the before and after photos. We moved house last year and I made a point to de-clutter then (I'm not moving stuff I don't use). A year after the house move and we still have stuff in boxes (waiting till we decorated). So I think when we have decorated and I go to get the stuff out I will assess the items as I get them out to see if I still love them. I know there's a food processor in a box that we haven't used for a year... THAT'S definitely going!! Thank you for a wonderful and inspiring post. I have the book and I'm starting a read through. I'm in my 60's and positively suffocating in stuff. Well, no more! The photos you posted made me feel light and happy. Cheers! My mother and 2 daughters and their 3 kids live with me but will be moving out by March. I clean to a point but in less than 24 hours it's looks awful again. I can't wait to read the book. I just want to bag up everything and throw it out! I'm ready. Most of our belongings have been in storage unit for a few years while we lived in a small apartment and worked various shifts. Then during a year of being live in managers at a small motel. Basically, no spare time to spend sorting/discarding of our stuff. I really do have my work cut out for me because hubby packed everything when we left for the motel business. We finally quit working and now have everything with us in one place. With this move, we have been purging alot. We started when we were removing boxes from the storage units. We have been forced to continue purging because there are no closets or real cupboard space for anything in this new place. Thank goodness it is a temporary situation. I re-organized the tupperware/food storage containers, donated alot of items and clothing to thrift stores, discarded broken items to the dump, took some clothes to consignment store, re-organized my craft stuff (knit,crochet and quilting) again donating bit of yarns and fabric to thrift store, purged spices and food stuffs, and re-organized some junk drawer items. I am self-motivated by the fact that we do not own our own house. We are semi-retired, own an RV and our goal for next year will be to travel as much as possible. I will admit I have searched the internet for organizational ideas which has also served as my motivation to purge. I say do whatever it takes to become motivated. Be strong and stick to your guns...tell yourself I am going to do it because in the end, purging just feels good. Good luck and have fun! My ah-ha moment was when I pulled together all of my drinking glasses & vessels. We had over 175 of them. All this for two people in our house--who rarely entertain!! There were drinking glasses, beer glasses, Tervis glasses, margarita glasses, wine glasses, plastic kiddie cups, coffee cups, tea cups, cups that came with our formal china, and souvenir glasses from our cruises. And then there were the water bottles and thermoses. Enough already!! We donated over half of them to our local thrift store--but I know we still have way more than we need. Pretty much could duplicate your entire post!! I loved the book, love the new mindset I have, have shopped so much more sensibly, and think I got rid of about 1/3 of our entire stuff! I love it when I come across someone else who feels so CHANGED in the same way as I do!! Oh my goodness, just came across this post and laughed until my stomach hurt while reading it! I am now about 2.5 years deep in purging my home in the Mother of All Post-Divorce Cleanup and Disaster Recovery Operations after splitting from my hoarder ex. Unfortunately I did not discover Mari Kondo's book until I was nearly through with major purge ops, and still haven't actually bought it yet, but intend to, and just might as soon as I finish posting this comment. I must have hauled at least 10 truckloads of stuff to the donation center, e-waste, recycler, etc., and sold off about two rooms' worth of "clutter furniture" and FINALLY, AT LONG LAST, am within striking range of having the clean, peaceful, orderly home that I absolutely need in order to have any semblance of sanity. I have been very defensive about what I allow back in, and when buying something (there is a lot of important infrastructure still MIA), I ask myself, "Do I love this enough to be willing to pay to put it in storage or ship it in the event that I move overseas again?" I am also getting much better at not settling for something I don't care much for and instead just waiting till I can save enough money to get the thing I really want. I have discovered that this is a multi-layered process, in that purging the uppermost layer of clutter allows the next layer down to rise to the surface and become plainly visible. Thank you for the tip about "projects in waiting" that never get done. I still have a number of those hanging around. I look forward to learning the "best practices" for dealing with what is left! Wow! I enjoyed this old post. Loved her book and I agree even though I was already the declutter type the book pushes you further. Bravo! I loved the book! I actually read it twice while I completed the process because there were so many helpful tips scattered throughout. I read this book and loved it, too. My biggest challenge was culling through my "keepsake" boxes. before I read it, I thought I had done a good job meticulously organizing my stuff into 12 (yes twelve) storage boxes. Then I thought I did pretty good when I had whittled it down to 6. After I read the book, I was able to pare down to three! I think I've only missed one or two items that I threw out, but the overall experience and results were worth it. I think Kondo really hit it on the head when she talked about emotional weight connected that is connected to an object, even if we're not really consciously aware of it. I realized that I had kept every single trinket and letter from a friendship that is no longer what it once was, and looking at it all made me realized that I had made an idol, for lake of a better term, of that friendship, rather than assessing the quality of that friendship. I kept a few things that signified the best and most memorable parts, and lovingly discarded the rest. It was a really emotionally freeing thing to do. Never heard of this book until now. Will look for it. My biggest problem is my husband. He wont get rid of anything. He even complains when I get rid of my own things. Every now and then I make things "dissapear" behind his back, but it is not enough. I just showed him this article and got angry and walked away. What can I do? Uugggg I’m seeing a pattern of the men not wanting to give stuff up. (Why is this?) That is my husband all the way. He can’t get rid of anything without complaining. I bought that TV �� 20 years ago and paid good money for it. And it still works�� but we don’t use it. I had to force him to throw away a pair of shorts that were too short that had bathroom caulking on them. That took me approximately five years... no joke! Hahaha just trying to see how it’s possible to Declutter with a husband who refuses to get rid of anything . I am knee deep in the process right now. I'm glad to hear that it ends eventually. I'm amazed by the amount of stuff we had in our house!